Spend a day in nature and get back in touch with your true self. "Retreats come in all different forms: a hot tub experience, a quiet jog, a touching movie watched on the sofa late at night, a day of writing at home, a girls’ weekend. It is a time to be quiet and reconnect with your inner self. Too much of it is called isolation and is destructive to our well-being. Too little of it is called being out of balance." Are you a woman in need of a break? Do you long for just one day and evening to re-connect with who you really are? Have you been pulled in so many different directions that your energy is waning? 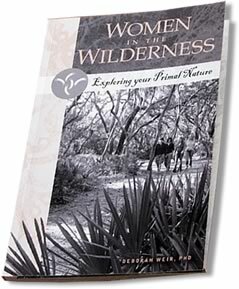 Then it's time to indulge yourself in a retreat by experiencing Women In The Wilderness: Exploring Your Primal Nature by wilderness therapist Deborah Weir, PhD. 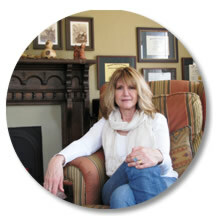 Deb is a very feminine wilderness survivalist and psychotherapist on a mission to help promote a more peaceful earthly existence. She idealizes that the only way to affect change is to bring feminine, nurturing consciousness to the psyche of individuals to balance out the masculine forces that have dominated for eons of time. Since the natural world is the primary feminine setting, herein lies the key. For years she has been encouraging women to find feminine solace and empowerment in the wilderness through nature retreats and wilderness therapy, while the ever-disappearing natural world is still available to enjoy. Deb's pushing a natural drug called wilderness magic, where women (and men) can find insight, healing, and stress management by connecting with the natural world. Based on an actual woman's retreat in a lush Florida forest, this book is designed to be a form of a retreat, simulating a woman's getaway. The soothing presentations, photos, artwork, quotes, and poetry provide entrancing suggestions to place the reader in the middle of an actual retreat. From opening the front cover and finding a brochure, to listening to the audio meditation CD that’s included, to meeting other attendees, the reader is given a vicarious wilderness experience. Included are enticing invitations along the way for the reader to join the various activities in the form of a personal solo retreat. If you've ever considered attending a woman's group retreat, this book experience can be a safe method of exploration. "Though I miss my daughters and my hubby too, this is where I needed to be. A time to heal, a time to bond with some incredible women in nature!" J.H. "We do come home, in a way, when we leave our "homes" and reconnect with nature." J.G. 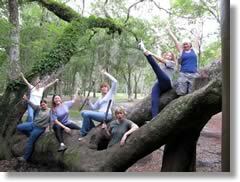 "I came to this weekend with a lot of stress and a drained feeling from recent events, but just being in nature in a quiet, tree-filled space allowed me to let all that go and just be...what a content and peaceful feeling..." M.R. "I have figured out why I come to these retreats. It is a way of visiting myself. Here, I'm not the me at work or the me at home or the mommy. I'm just the me that's me." C.D.